Summer is beach time! 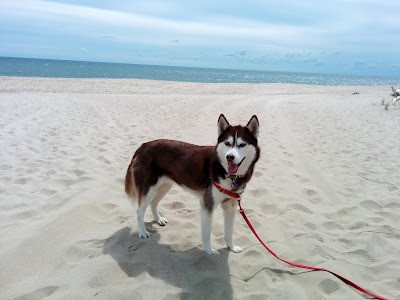 Time for the sun, the surf, the blazing hot sand burning your paws.... That's right, in addition to other safety considerations for your dog at the beach, the hot sand can be a big concern. Sand can get even hotter than pavement when the sun is beating down on it and reflecting off the water! Here are some extra precautions that should be taken to prevent scorched paws when you've planned a beach outing with your dog. People don't always think about the danger of their dogs walking on scorching hot sand with bare paws. Sand gets much hotter much faster than the water. The water temperature at the beach may be in the 70’s (F) but the sand can reach 100 degrees or more! The sand doesn’t reflect heat off of it the way water does. Sand also doesn’t have the continuous movement like the water does, it's just sitting there with the sun constantly beating down on it, unable to cool itself down with movement the way the ocean does. * Take your dog to the beach before 10am or after 5pm when the sand is cooler. Sand gets hot really fast but it also cools down quickly as the sun sets. * Sit a little closer to the water where the sand is damp and doesn't get so hot. Both you and your dog can cool off your feet as the surf comes in! 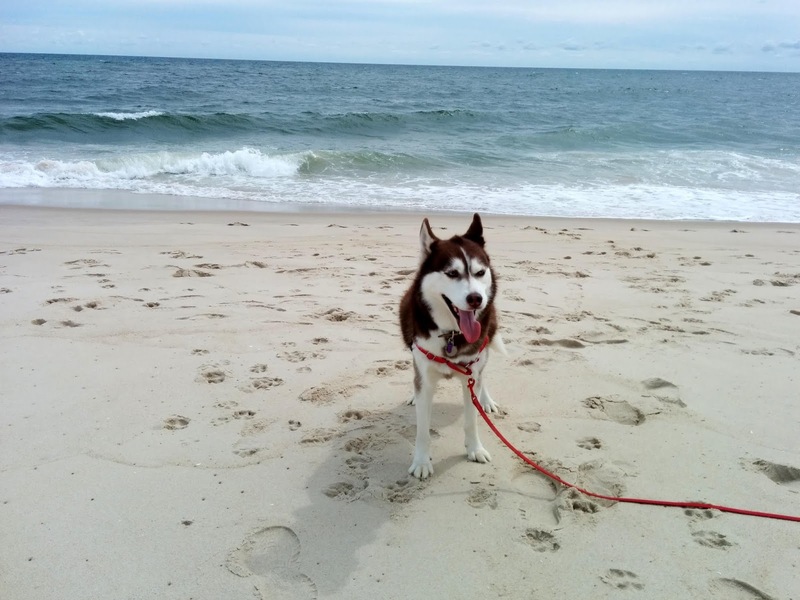 * Just as we wear sandals or shoes to walk down on the sand to the perfect spot we choose on the beach, you may want to put some shoes on your dog's paws just until you get close to the shoreline. If you don't want to put shoes on your dog's feet, you can carry her or put her in a stroller or cart until you get closer to the shoreline. * Watch out for the concrete or asphalt parking lots and walkways at the beach as well, they can get hot enough to fry an egg! * Make sure to bring plenty of water and hydrate, hydrate, Hydrate! * Keep an eye on your dog to ensure she doesn't suffer heat exhaustion. Find some shade, or if there isn't any shade on the beach put up a large beach umbrella for shade. In a pinch, you could make a "tent" with towels and beach chairs to provide some shade for your dog. * Know whether or not your dog knows how to swim .... in beach surf! Not all dogs are born swimmers. Even if they have a propensity for water, swimming in the ocean isn't the same. The waves may not be gentle enough, or there may be an under toe to worry about. * Keep an eye on your dog at all times to see if she gets into any trouble in the ocean. It's a smart idea to put a doggie life vest on your dog the first few times she goes into the ocean. Dogs are natural born followers and will often follow each other right into rough surf! I usually opt for beaches on the bay side rather than the open ocean for my dogs. Michael Phelps they are not! * Have your first aid kit with you in case your dog's paw gets cut on a broken shell or on the rocks. Have Fun and Stay Safe on the beach!! Do you take your dogs to the beach? What is your most important safety tips? Leave us a comment and share, we always love hearing from you! THIS IS THE THOUGHTLESS THURSDAY BLOG HOP! I hope so too, thanks Lily & Edward! Great tips. Dog parents don't always think of these things. It's easy to forget about beach safety for your dog. Thanks for stopping by! Your mom is smart, it's the best time for dogs to go to the beach. Thanks for stopping by Reilly & Denny! Great tips! We're in Florida and just 15 minutes from a dog friendly beach, so those tips are what we live by. My number 1 would be to make sure your dog has a reliable recall and leave it, even if they're leashed. You never know when your dog may want to investigate a jellyfish or someone's trash. Oh yikes! You've got to be wary of hot sand pretty much all year round. I forgot about the jellyfish, you are so right about needing reliable recall and leave it commands! Thanks so much for sharing that tip Nola! Thanks for hopping with us! ☺ We were just discussing how much Bentley and Pierre would love the beach! Thanks for co- hosting the blog hop! I'll be they would love the beach, I can see Pierre jogging along the beach looking like Bo Derek in the movie "10" BOL!! Thanks for stopping by M.K.! Great tips!!! 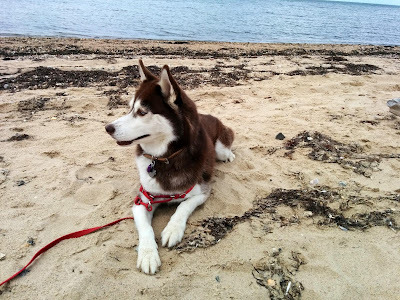 I love the beach, my huskies lovvvvvvve playing in the sand too! They always catch a major case of the zoomies when they find sand to play in! Thanks Jenna! I can just imagine your 3 Sibes romping in the sand having a blast playing together! Thanks for stopping by! Thanks! I definitely would rather be safe and not sorry! Thanks for stopping by! Wonderful tips for the beach! Keep up the great work! Thanks Josh, much appreciated! Thanks for stopping by the blog to visit us! Great tips. Back when I had a lab, she loved the beach! Thanks Carleen! I'll bet your Lab must have had a blast at the beach, Labs are made for the water! Thanks for stopping by. Things I have never thought of. My sister and niece live in Florida, very close to the beach. I am going to send them this. We live in Missouri, so the beach is not to much in our future, unless we take a trip to the Ozarks and I don't think those beaches are quite the same. I'm so glad you found these tips helpful and that you want to share them, thank you! Sorry you don't have much opportunity to get to a beach! Thanks for stopping by Teresa! Good leave it is key. So far the dogs have found a dead beaver, dead fish, dead birds and an unidentified animal. Also make sure they don't drink the water! Oh absolutely! Having a solid Leave It command and not drinking the sea water are very important tips, thanks for that reminder! 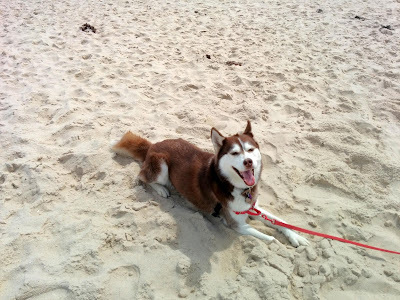 My Husky did once try to get a dead horseshoe crab in her mouth! She was so fascinated by it LOL! Thanks for stopping by and adding these two tips! These are such important tips! It is easy to forget how hot the pavement and sand can get in the sun. We tend not to think about it too much as humans because we so frequently wear some sort of shoe when outside. Thank you for the great reminders! I'm glad you like the tips, thanks! I know, it is so easy to forget how scorching hot the sand and pavement can get. I've had to stop in the sand on my way down to the beach and put on shoes more than once myself! Thanks for stopping by Robin! These are great tips and applicable in Australia too where most of our summer days are scorchers! Ouch! I can imagine how hot the beaches in Australia must get. Thanks for stopping by Tracy! Great tips, and I'd never really thought about keeping closer to the shore itself but it makes perfect sense. And you're absolutely right about bringing plenty of water, I think a lot of people underestimate how much water dogs need on hot days. Definitely so much cooler the closer you get to the water, the sand is usually hottest the further away from the shoreline it gets, you don't have the benefit of the tide going in & out each day to cool it down. So true about the water, my dogs drink SO much water outside on hot days, even in the shade. Thanks for stopping by Jen! We are heading to the beach in Sept and these tips will really come in handy! I'm so glad these tips will be helpful for your trip to the beach next month! Hope you have a great time, and don't forget to post photos of your trip! Thanks for stopping by! It was so hot here this weekend, and we saw dogs running around on the hot pavement. I felt so bad for them!! These are fantastic safety tips. I hope that a lot of dog owners will find them and protect their precious fur babies from all the summer dangers. Oh no, poor dogs! Hot pavement is NOT fun for pets. I'm glad you like these tips, thanks for stopping by the blog! Thanks Bernard, I'm glad you liked these tips! The ocean really can sneak up on anyone, especially an unsuspecting pooch who doesn't know how to swim in the waves. Old saying, "Respect the ocean, never turn your back on it"! And yes, Always keeping an eye on your dog around water is so important. Thanks for stopping by! Love this post! My boy Wolf loved our visit to the beach - his first last year! So many great tips! Already shared it so others can check this out! I'm so glad you enjoyed the post, Dorothy and thanks so much for sharing it! I'm glad you like the photos too, they were taken in The Hamptons out in Eastern Long Island. Thanks for stopping by! PS - LOVE all the beautiful pics! Keep Dogs Busy With This Toy! Can I Potty On This?